"The award-winning show, SIX®, continues to amaze audiences with their ability to consistently deliver powerhouse vocals, impeccable harmonies, and high-end professional production unparalleled in Branson. 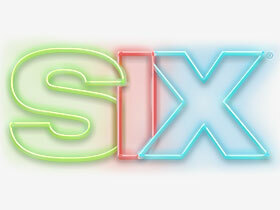 SIX® is made up of six real-life brothers who take musical entertainment to a whole new level. Dubbed "An Orchestra of Human Voices", these multi-talented brothers sound like a band using only their mouths. Infusing lively choreography and dysfunctional family comedy into the show that only brothers can do, they perform everything from contemporary pop, to R&B, to classic rock-n-roll, to “do-wop”, to Gospel, to Patriotic. Whether you’re bringing a group, your family, or just flying solo, SIX® is a phenomenal experience or, as we like to say, “SIX-perience”, where Boomers to Millennials are ultimately left wanting more. Once you experience it, you will understand the power of SIX®!"